Mercury, performed by the Ecce Ensemble. May 1st at Brandeis University. May 15th at the DiMenna Center. New York, NY. Concert also featuring works by Liza Lim, Gerard Grisey and Mark Andre. Nolan Pearson premieres Flux, Flutter in Istanbul. 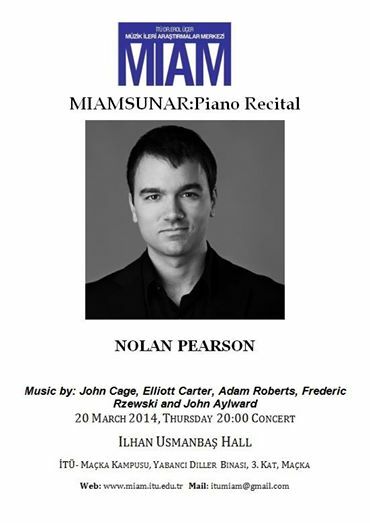 March 20th, at the Istanbul Technical University’s Center for Advanced Studies in Music. Two new works will be premiered at the Etchings Festival along with works by Beat Furrer. Performances by the Ecce Ensemble and Garth Knox.